Francis Merlin “Bud” Estes was born in Jackson Hole, Wyoming, on October 1, 1909, the child of ranchers and homesteaders. He loved sports and during his early adolescence he aspired to be a professional baseball player. At sixteen, however, an incident with a drunk forever changed his life. Returning to their parked car from a day of hunting, Bud and his brother witnessed a man drive into their car’s bumper. The man, intoxicated, got out and accused Bud of backing onto him. An argument ensued and the man, angered, pulled out his shotgun and fired. The shot went through Bud’s upraised arm, head and shoulder. He spent a year in the hospital recovering. The man, again intoxicated, was later hit by a train. After a period of recovery, Bud studied Judo in 1923 at a small school in Los Angeles. He received his Black Belt from this school in 1925. Moving to Washington, bud became involved with the Salvation Army; he soon left home to attend the Salvation Army Officer Training College in San Francisco. He graduated with the rank of Captain and was sent to Honolulu to take charge of a boys’ home. In Hawaii, 1930, Bud met master Okazaki and was invited to visit his school. Impressed with this system, he discarded his black belt to start as a white belt at the Kodenkan. While he was in Honolulu, he married, had two children and divorced. He left the ministry and soon became a Federal Bureau of Narcotics undercover agent. He was often sent on dangerous assignments requiring the application of his Jujitsu techniques. In one case, while arresting drug smugglers, he was attacked with a large machete with a blade of about 2–1/2″ wide. The blade caught his skin and sliced it. The wound was superficial and Bud proceeded with the arrests. The rest of the smugglers gave up without a fight. Bud received his Shodan, Nidan and Sandan degrees from Master Okazaki. In April 1939, he returned to the mainland ; this time to Chico, California, where his family had moved while he was in Hawaii. By may 1, he began a Jujitsu class on the front lawn of his parents’ home. Lukie, who was in high school, joined the class along with Bud’s sister Pat. During the next few years bud was again married and divorced. When World War II began, he started classes at the Chico airport for the military police stations at the base. In 1943, Bud received his Yodan from Master Okazaki. In 1946 Master Okazaki awarded him a Kaidensho (“teaching license”). Lukie, meanwhile, graduated from high school and took a job as a traveling manager for western union. In 1944, she returned to Chico and resumed her classes. July 1, 1945, Bud and Lukie were married. The Chico Judo and Jujitsu Academy continued to grow and courses were taught to state militia, county sheriffs and city police. Lukie attained the rank of Godan and was made a Professor in December, 1956. Over the years, Chico Judo and Jujitsu Academy saw some of its students start as children and continue to adulthood, receiving Black Belts and beginning new schools of their own. Bud, co-founder of the American Judo and Jujitsu Federation, received his Judan in 1971. Among his numerous accomplishments, Bud was one of the major forces behind the acceptance of Kodenkan Jujitsu as an Amateur Athletic Union recognized sport. Professor Bud Estes dedicated over fifty years to the propagation of Kodenkan Jujitsu. He died on June 7, 1981. 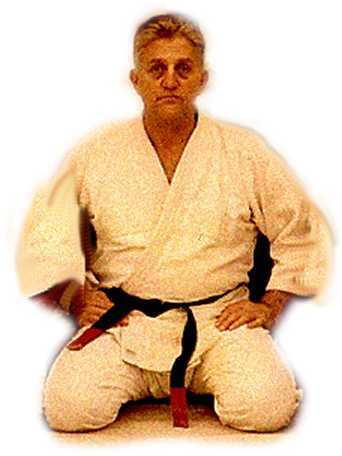 Professor Lukie Estes contributed to the perpetuation of Kodenkan Jujitsu for over four decades. She was promoted to Rokudan in 1982. She died on September 28, 1982.